This was my gingerbread house for several years of "after Thanksgiving lessons." Yes, it's tacky, but students in the early childhood classes loved it. 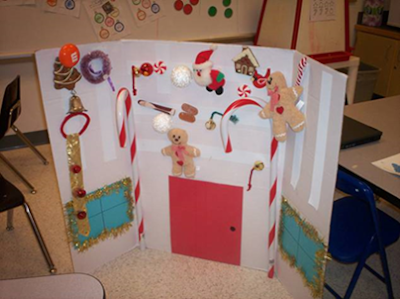 Simply add a door and windows to a folding display board, add Velcro strips, and invest in some dollar store holiday items. Many of my items were cast-offs. Pair with a book about a gingerbread house and teach the adjectives big, little, noisy, rough or bumpy, smooth, hard, and soft. Students chose a holiday decoration, used one or more adjectives to describe it, and then placed it on the board and told its location (next to Santa, over the window, etc). Introduce the adjectives by presenting objects (rock, cotton, sandpaper, and bells) with pictures. I think your 'gingerbread house' is cute and this is a clever idea! Thank you! I could use it for a variety of goals throughout the holiday season and my students always enjoyed it. What items did you use? I'm trying to discern what items are in the picture, but having trouble. I see candy canes/peppermints, gingerbread men, gingerbread house, santa, wreath, christmas tree, jingle bells, bird...what else am I missing? I don't know if I can get this together for this year, but I'll get a head start on it to use next year. 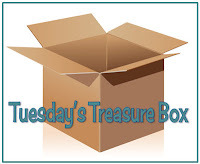 :) Very cute to use with my preschoolers! Thanks! I Wish that I had taken more photos. I had a lot of old unbreakable ornaments and Dollar Store purchases. Some days we put "big" and "little" items on the board. During other sessions we used the hard, soft, rough, and noisy items. I had some heavy duty Velcro so could put almost anything on it. A teacher borrowed it one year to teach shapes and colors - shapes were just cut from construction paper and it really looked cute.